The intimate yet elegant Bienville House, a historic hotel in New Orleans, caters to tourists and corporate travelers alike. The hotel calls to mind a stately French Quarter manor house, with decorative wrought iron balconies and a gracious flagstone courtyard. Inside, tile floors, hand-painted murals, decorative chandeliers and overstuffed furnishings convey an old-world ambience. Guests at this stylish French Quarter hotel will find themselves in the midst of what makes New Orleans so memorable - from the never-ending party on Bourbon Street, to the quiet elegance of Royal Street – while still offering a sense of tranquility from the hustle and bustle. Relaxing on the upper balconies and sundecks or by the splash pool is a perfect way to unwind after a long day of meetings or sightseeing. 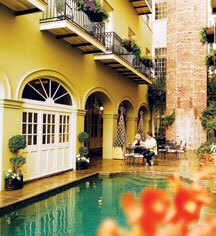 Bienville House, a member of Historic Hotels of America since 2006, dates back to 1835. The Bienville House's colorful past included functioning as part of a large rice mill complex before being converted to a hotel in 1967. Pet Policy: Service animals allowed: Yes. Pets allowed: Yes. Deposit: $100.00 cleaning fee (Non-refundable). Fee: $25 per night. (Subject to change). Other: Guests traveling with pets will have a mat, two bowls, a treat and a brochure placed in their guest room prior to arrival. The brochure includes a pet map, pet hotel polices, and a “pet in room” key-card. 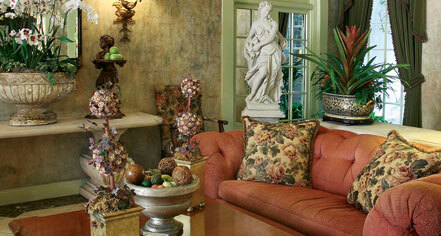 Learn more about the History of Bienville House .